IDAutomation’s ActiveX Controls are easy to use “drag and drop” plug-ins for Microsoft® Access, Excel, Word, and other MS Office applications. The ActiveX Controls support several linear and two dimensional barcode symbologies including Code 39, Code 128, Interleaved 2 of 5, LOGMARS, Extended Code 39, GS1-128, Codabar, UPC-A, UPC-E, MSI, EAN-8, EAN-13, USPS OneCode, POSTNET, PDF417, Data Matrix and others. The ActiveX Control plug-in must be installed in Windows® before applications will be able to “see” it. IDAutomation has provided an installation utility that will install the control on a local PC. The ActiveX Control may be ordered or a demo downloaded from IDAutomation. After the plug-in has been installed on a local PC, the control may be used in any application that supports ActiveX Controls. For applications that are not listed here, search the application’s help file for information on how to use ActiveX Controls. Below are a few examples of implementing IDAutomation’s controls in Microsoft® Word, Excel, and Access. 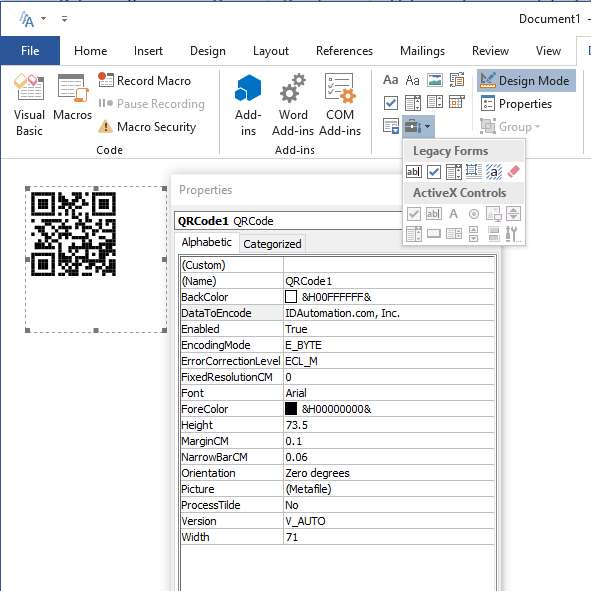 In a Microsoft Access report in design mode, choose Insert – ActiveX control. Size the control as necessary. To change the properties of the control such as barcode height and symbology type, right click on the control and choose Properties. To bind the control to a data source, enter the table and field or formula in the control source field. The proper barcode will show up after the report is saved. In Microsoft® Excel, on the Developer Tab, choose Insert – ActiveX Controls – More Controls. Select the barcode control from the list of available ActiveX Controls. After selecting it, click and drag an area for the control to appear in the spreadsheet, size the control as necessary. To change the properties of the control such as barcode height and symbology type, right click on the control and choose Properties. When finished, exit design mode by choosing the design mode button. To edit the properties of the control the program must be in design mode. If there are problems editing the properties of the control, press the design mode button to enable it. To link a cell to the data to be encoded in the barcode, enter the cell in the “LinkedCell” property of the control. In Microsoft Word, on the Developer Tab, choose Insert – ActiveX Controls – More Controls. Select the barcode control from the list of available ActiveX Controls. After selecting it, the control will appear in the document, the control may be sized as necessary. To change the properties of the control such as barcode height and symbology type, right click on the control and choose Properties. To edit the properties of the control the program must be in design mode. If there are problems editing the properties of the control, press the design mode button to enable it. When finished, exit the design mode.